Hope and optimism are different. Optimism tends to be based on the notion that there's enough evidence out there to believe things are gonna be better, much more rational, deeply secular, whereas hope looks at the evidence and says, "It doesn't look good at all. Doesn't look good at all. Gonna go beyond the evidence to create new possibilities based on visions that become contagious to allow people to engage in heroic actions always against the odds, no guarantee whatsoever." That's hope. 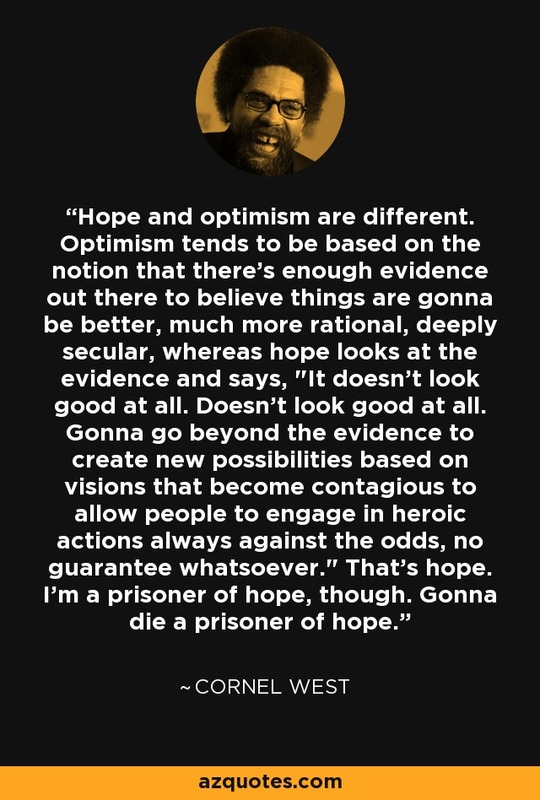 I'm a prisoner of hope, though. Gonna die a prisoner of hope.